Starting a business and finding investments is much easier when one has a well-defined customer value proposition. Founders of the company need to be sure about their business model, expected financial outcomes, and how exactly a company is going to spend its venture capital. While this sounds logical, startup companies tend to focus on their product too much and forget about customer needs and financial results. On the one hand, the challenges mentioned above can be addressed by the Balanced Scorecard, and on the other hand, startups normally have a lot of other things to do, and they don’t have time for “paperwork” like, for example, formalizing their business goals on a strategy map. 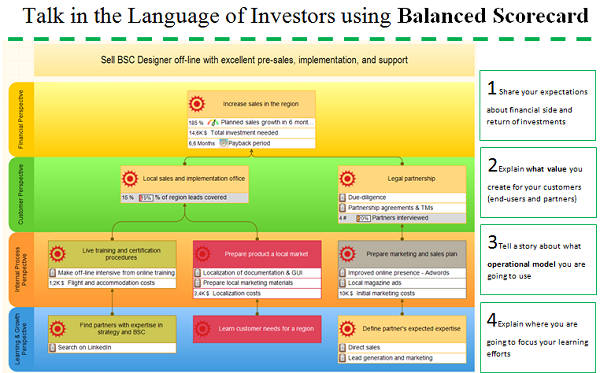 Still, the Balanced Scorecard exercise is very useful for a startup company. Let’s discuss how exactly it can help. Why does a startup need a Balanced Scorecard? It makes sense discussing two arguments. Argument 1. Getting a clear understanding of the strategy. Key learning and growth direction to focus on. Argument 2. “Selling” the idea to the investors. What customer’s problem you are going to solve, and if your business model and team are ready to solve it. Both arguments are important, but when explaining the idea of a Balanced Scorecard to the startup founders I found the second argument much more convincing. For sure, it is possible to present all the same information on several PowerPoint slides, but the trick is that investors came from the corporate world where they have some standards for presentation of the information and the Balanced Scorecard is becoming one of those standards. This idea is actually very similar to why non-profit organizations need to have BSC. We have some step-by-step guides on building and implementing Balanced Scorecard (as well as an Online Training where you will build a prototype of your own business scorecard), so now I’ll focus only on the nuances that I believe are important for a startup company. Learning and growth.A general idea of this perspective is to show where you need to focus your learning efforts in order to create the best value for your customers. In a case you are looking for investments, you normally don’t just look for money, but also for an expertise in a certain area. Map your learning priorities using this perspective. Start with financial indicators and respective market numbers. Make sure you understand and can explain to the investors what you are going to use to track overall success, as well as success in achieving specific objectives. On the strategy map you have some key business goals only. They need to be explained in the supporting documentations. For the presentation purpose you might want to add some short notes under your goals. For investors these are probably the most important questions – how much of investments do you need and how are you going to spend them? Make sure there is information about the budget you need for each major goal and the total cost to execute your strategy. Have a look at this strategy map that was given out as an example to the participants of the venture investment event “Sabantuy” in Belgrade, Serbia. Startup Balanced Scorecard online - sign-up with a free account for immediate access to 16 scorecard templates. 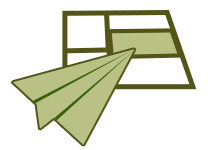 The strategy map explains a strategy of the company to enter the local markets. Indicators that are aligned with business goal “Increase sales in the region” explain planned sales growth in 6 months, total investment needed and payback period. Business goals from the customer perspective explain that additional customer value is created via opening local offices and establishing partnership relations with local experts. 3 big goals in “Internal” perspective give an overview of the key milestones in opening local offices and challenges that local partner supposed to address. Business goals in that perspective have a proposed budget aligned with them. Goals in the learning perspective respectively focus company’s learning efforts and what matters for understanding local market and clients. First of all, a Balanced Scorecard approach will help you to crystallize your understanding of company’s strategy, customer value proposition, and the way to achieve ultimate financial results. Second, it will help to explain your idea to investors. It won’t replace a well told story with some nice presentation slides, but having a strategy map with aligned KPIs, initiatives, and budget details will be an excellent addition (and it is becoming in must today). The last, but not least thing is that you’ll start with a professional business tool and this type of investment is one that always pays you back in the long term. 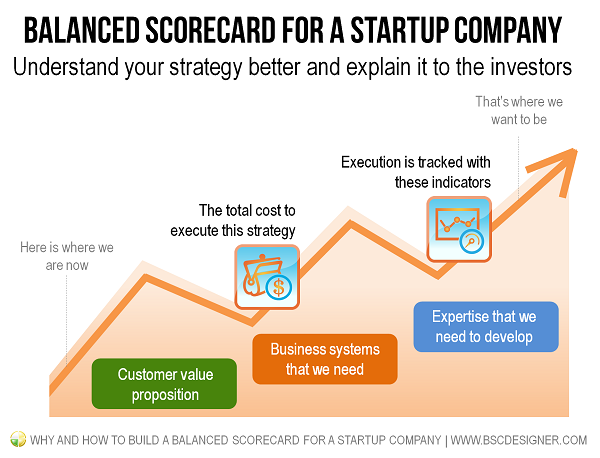 Startup Balanced Scorecard discussed in this article as a starting template for your own scorecard!